In Egypt, junk foods have more than hit mainstream. A recent study led by USAID’s predecessor Maternal and Child Health Integrated Program (MCHIP) and published in the journal Maternal and Child Nutrition, revealed that families commonly believe junk foods are “essential foods,” often taking the place of nutritious foods for children less than two years of age. Given that Egypt is facing the double burden of malnutrition and obesity in children, the health consequences of this new way of feeding are considerable. Rates of both stunting and overweight are rising in Egyptian children, with one of every three children under five now stunted or too short for his/her age, and one of every five being overweight. To examine the cultural beliefs and perceptions that influence feeding practices in the country, MCHIP and the SMART Project carried out an implementation research study that investigated factors related to children being too short for their age compared to the World Health Organization (WHO) global child growth standards. The study used Trials for Improved Practices (TIPS) methodology, developed by the Manoff Group, which involves talking with, counseling and motivating mothers to make feasible changes in feeding their children over a one-week period. 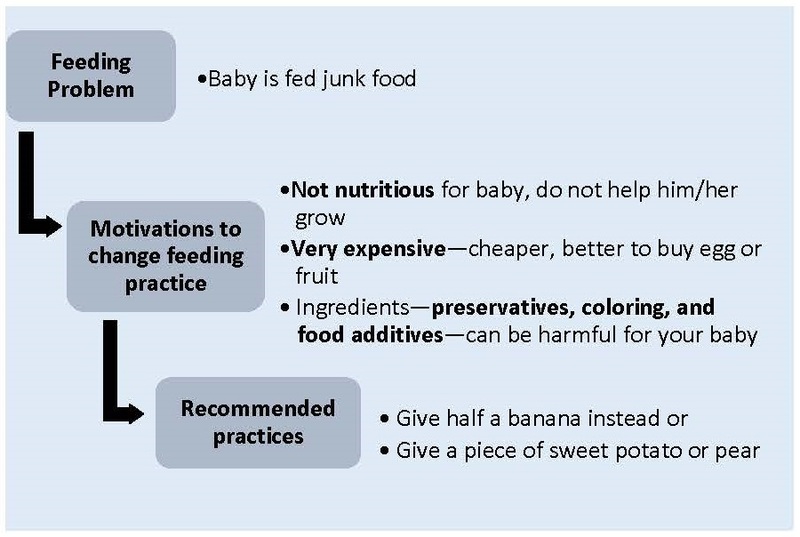 Through TIPs, the problem of junk food as a feeding problem was uncovered by discussing with mothers their behaviors, practices and motivations for infant and young child feeding during the first household visit. During the second visit, mothers jointly decided (with the research team) what could be improved and which changes in feeding were feasible, and agreed to try the recommended practices for a one-week period. Finally, during the third visit, mothers discussed their experiences with TIPs—what recommended practices worked, which ones did not work, and any modifications that were made (see Figure 1 below). Figure 1. An example of how TIPs addressed junk food as a feeding problem. Shifting cultural beliefs and inspiring behavior change is not easy, but it is possible. At MCSP)—the principal follow-on to MCHIP—we are continuing MCHIP’s work and providing selected nutrition expertise to USAID and priority countries, which call for nutrition integration into the platform of health services. 1. BREASTFEEDING IS VALUED, YET MOTHERS INTRODUCE JUNK FOODS TO YOUNG CHILDREN EARLY. 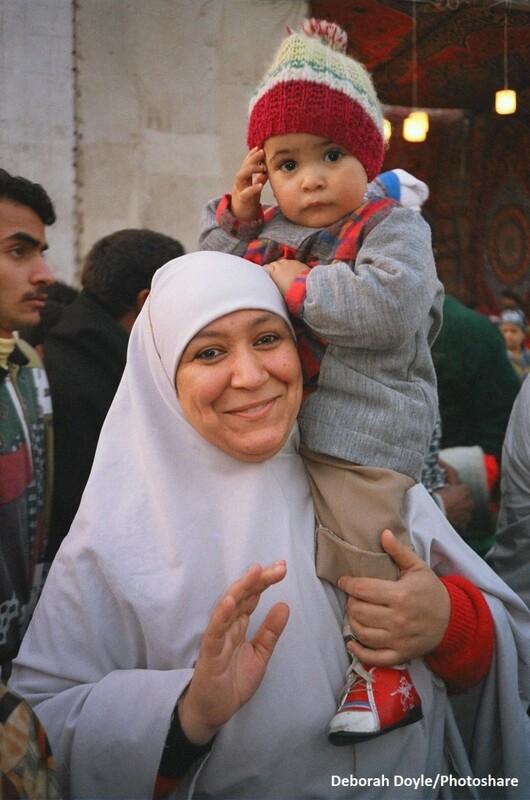 Egyptian mothers are committed to breastfeeding and understand its benefits. However, only 25% were exclusively breastfeeding in the first six months of life—a critical period for prevention of illness and death, and for healthy growth and development in children. Feeding foods and herbal drinks in the first days of life is common, and herbal drinks and teas are prescribed by some health providers. 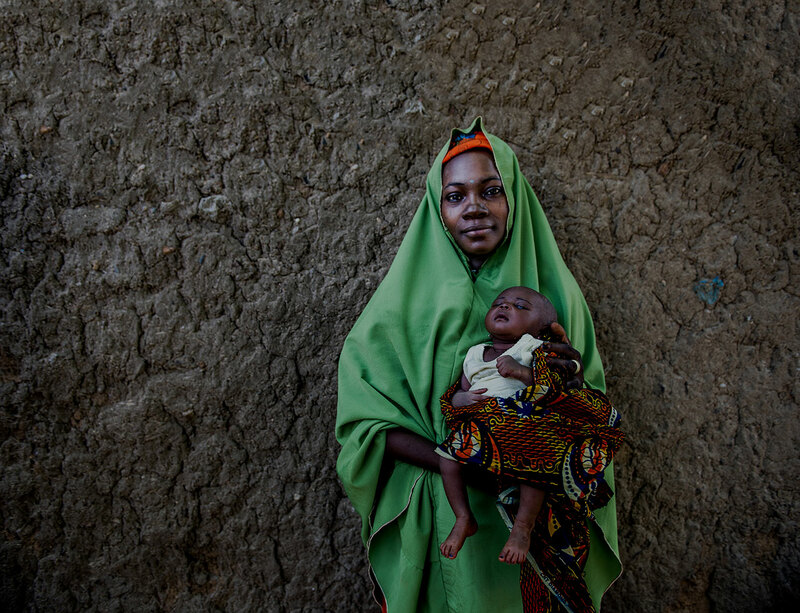 During the first six months, some mothers, grandmothers and health providers believe children are not “nourished enough” by breast milk alone and are still hungry. This was cited as the main reason that mothers introduce foods and liquids early. Mothers feed “light and simple” foods, like yogurt and sugary biscuits, as early as two months of age. 2. JUNK FOOD IS A SIGNIFICANT PART OF THE DIET IN THE FIRST TWO YEARS OF LIFE. 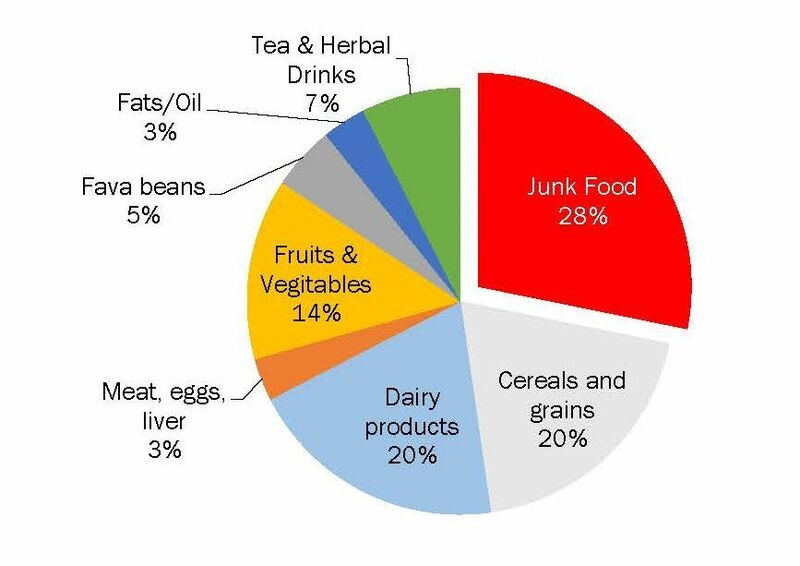 In fact, nearly 30% of foods fed on a daily basis are junk foods (see Figure 2 below), including: potato chips; sponge cakes with cream filling; sugary biscuits; sweets and candy; and sugary drinks. Junk food was a problem in both Lower and Upper Egypt; however, it was more of a problem in Lower Egypt. Figure 2. Daily Food Frequency. Definitions and Specifications: Cereals and Grains: bread, rice, macaroni, rice pudding, wheat porridge made with milk and sugar, tubers (potato, sweet potato, and taro). Dairy Products: fresh milk, milk powder, cheese (Karees, processed white cheese), yogurt. Junk Foods & Sugary Drinks: 1) Ready-made snacks: Locally made potato chips (caratee), store-bought potato chips, store-bought small sponge cakes; 2) Biscuits: sugary cookies; 3) Sweets & Candy; 4) Sugary Drinks: fizzy drinks, sodas, and store-bought juices. 4. THROUGH TIPs, BUILDING ON MOTHERS’ MOTIVATIONS, MOST WERE ABLE TO MAKE SMALL, FEASIBLE CHANGES IN THEIR CHILDREN’S DIETS. The intention of TIPs is to shift mothers’ thinking, building on their motivations for making small changes in choosing to feed locally available, high-quality foods, and taking ownership of their children’s health. The study revealed that mothers reacted positively to TIPs recommendations. They were excited and happy as the recommended changes in feeding resulted in improvements in child’s sleep, better appetite, and less illness. After the one-week trial period, improvements in dietary intake of fat, energy, calcium, iron and vitamin A were found. Recent WHO guidelines on sugar intake strongly recommend reducing intake of sugar to less than 10% of all calories from food and drinks. Future programming in Egypt should build on successes and challenges revealed through TIPs to achieve meaningful and sustained improvements in infant and young child feeding practices. This includes reducing snack food consumption while keeping cultural influences and beliefs in mind. 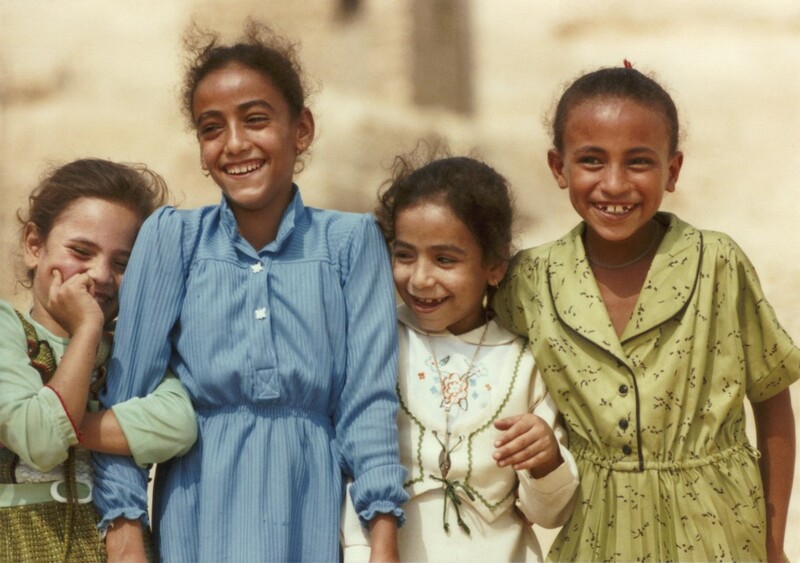 In Egypt, we believe that strong partnerships and evidence-based interventions will yield a healthier, happier future for the country’s children. To learn more about MCSP’s work in nutrition, click here.